I picked up a packet of almond-flavoured agar-agar (or simply agar, which is similar to gelatin but derived from red algae instead of animal proteins - yes I looked that up) from the Asian store some time back because I like making simple desserts. 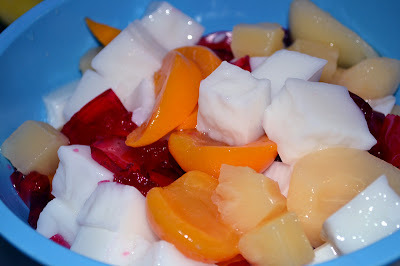 Incidentally, the same packet had this cool idea of mixing up some agar cubes with tinned fruit salad. What could be simpler? I just had the opportunity to make this last weekend when we had some friends over. 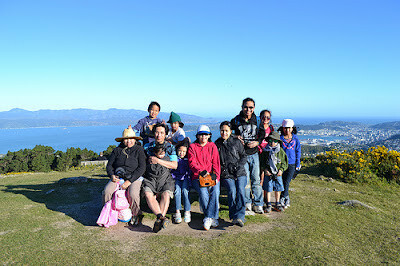 They wanted to enjoy the sunny, great outdoors by tramping up the mountain and wanted Jo-Lo and myself as tour guides. We would all be back home by sundown and we knew everyone would be famished by then, so my wife decided to whip up some pasta in white sauce and I cooked the Agar and the gelatin ahead of time so it can cool down while we're away and then I can just combine the ingredients together when we get back. - Gregg's gelatin is too soft to handle getting moved around. My wife suggested using the Alsa brand instead (which can be bought from the Filipino store; it's what she uses for Buco Pandan). For now, I'm striking Gregg's off the ingredients list and will update this recipe once I am able to try out Alsa. 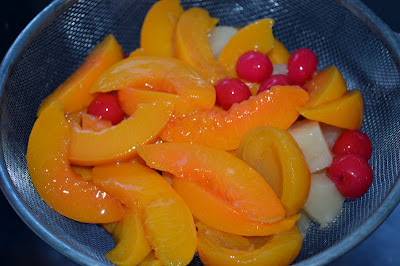 - do not use the typical canned fruit salad which chops up the fruits into small pieces and submerged in sweet sauce. Try using the chunky variety, and only in fruit juice. The fruits taste great without the extra sugar, and the bigger portions actually make it look like it did not come from a can at all. 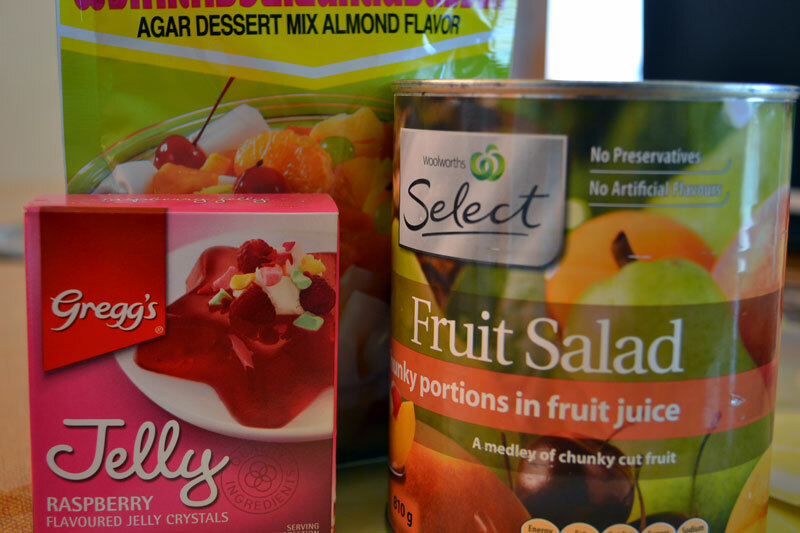 In this case I am happy to endorse Woolworth's Select brand (see photo below - there are even whole cherries in it!). Needless to say, our guests loved it. Even the kids came back for seconds, and I'm sure it's not because everyone was so hungry from all that walking! Try this, it's hassle free. Cook the agar as per packet instructions. Cut the agar into cubes. Drain the fruit salad mix. Layer the fruit salad with the agar cubes for even distribution. Keep refrigerated until it's time to serve dessert. One of a kind fruit salad.. Delicious !